Calcinosis is traditionally classified as either dystrophic or metastatic based upon etiology. In 1949, Gore and Arons defined dystrophic calcification as localized deposition of calcium salts that occurred in previously damaged or necrotic tissue. Cardiac pathologies which provide the foundation for this phenomenon include myocardial infarction, endomyocardial fibrosis, and infections such as tuberculosis. Metastatic calcification, on the other hand, is more common, nonlocalized, and involves previously healthy tissues in which calcium salts are deposited. Common underlying conditions are associated with derangements in calcium and phosphorus metabolism and include renal failure and hyperparathyroidism among other toxic pathologic conditions. Toxic shock syndrome (TSS) was first described in 1978 as a syndrome characterized by an erythematous rash, high fever, shock, and multiple organ failure. Organ parenchyma in every system of the body can be severely damaged during TSS., Myocardial dysfunction, in particular, is one of the well-recognized complications of TSS. Alterations in blood flow, direct endotoxin-mediated cellular membrane injury, production of increased cytokines and other substances which induce myocardial depression, aberrations in myocyte calcium concentrations, and the development of mitochondrial dysfunction all have been proposed as contributors to this myocardial dysfunction.,, The resultant injured myocardium may then act as a nidus for calcium deposition. This is a case of streptococcal TSS complicated by cardiac arrest and left ventricular calcification. While sepsis-related myocardial calcification is a rare phenomenon, it can lead to significant morbidity and mortality and therefore requires further investigation. Early recognition and intervention is of upmost importance to improve patient outcomes. A 29-year-old, gravida 3, para 3 female with an insignificant medical and surgical history presented with a 2-day history of fever, malaise, abdominal distension, diffuse ecchymosis, and rash on the trunk and proximal extremities. She was 7 days' postpartum from a spontaneous vaginal delivery without episiotomy. Her antepartum course as well as labor and delivery had been without complication. Before the onset of fever and rash, she had been having an unremarkable postpartum course with a minimal amount of lochia discharge. On presentation, however, she was found to have a blood pressure of 60/54 mmHg, heart rate of 133/min, respiration rate of 10/min, and body temperature of 97.2°F. She was severely dyspneic and required endotracheal intubation secondary to acute respiratory failure. Cultures were drawn and she was started on empiric intravenous antibiotics as well as aggressive intravenous fluids. She was subsequently transferred to the intensive care unit. Laboratory values demonstrated numerous abnormalities consistent with acute renal failure, shock liver, and disseminated intravascular coagulation secondary to TSS. Blood work revealed a leukocytosis of 23,000/mm3, platelet count of 59,000/mm3, creatinine of 2.23 mg/dL, estimated glomerular filtration rate of 26 ml/min/1.73 m2, alanine aminotransferase of 353 IU/L, aspartate aminotransferase of 1155 IU/L, alkaline phosphatase of 115 IU/L, total bilirubin of 5.4 mg/dL, direct bilirubin of 3.5 mg/dL, activated partial thromboplastin exceeding 200 s, prothrombin time of 40.6 s, fibrinogen of 137 mg/dL, fibrin degradation product level >20 ug/mL, and D-dimer value >20 mcg/mL. Lactate was elevated at 14.9 mmol/L, and an ionized calcium was 0.99 mmol/L. Urine studies were unremarkable. Vaginal and blood cultures grew out group A Streptococcus. On imaging, a chest X-ray demonstrated diffuse bilateral ground-glass opacities. A transthoracic echocardiogram demonstrated diffuse global hypokinesis with a left ventricular ejection fraction of 10%. Ultrasonography and a computed tomography (CT) of the abdomen and pelvis were unremarkable. In the intensive care unit, the patient was treated with intravenous clindamycin and penicillin G for streptococcal TSS. She was placed on vasopressor support for refractory septic shock and managed on a mechanical ventilator for acute respiratory distress syndrome. She was placed on continuous venovenous hemodialysis due to oliguric renal failure. The morning after admission, the patient was found to be in cardiac arrest and underwent cardiopulmonary resuscitation until spontaneous return of circulation. Upon recovery of a pulse, she was discovered to have developed cardiac tamponade and urgent surgical drainage of the pericardial effusion was performed. She was then placed on a venoarterial extracorporeal membrane oxygenation circuit. 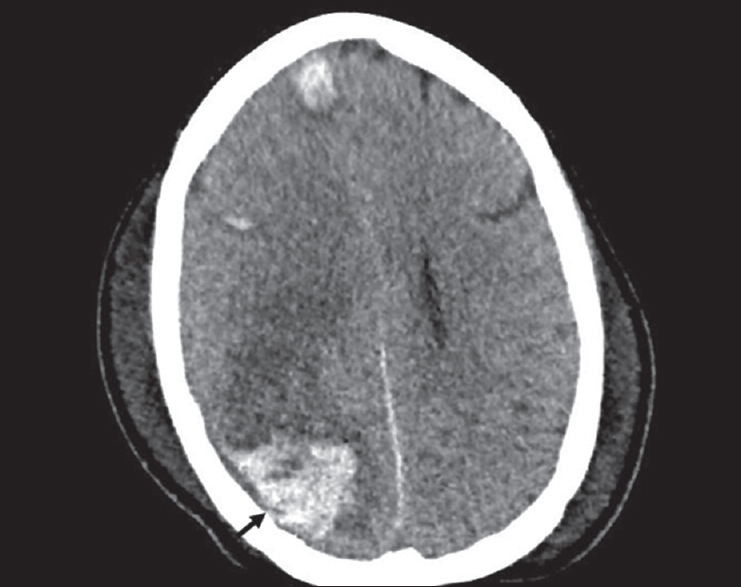 Her hospitalization was characterized by further complications, including hypoxic-ischemic encephalopathy with hemorrhagic transformation [Figure 1] as well as acute compartment syndrome requiring a below-the-knee amputation. After several weeks in the intensive care unit, however, she showed clinical improvement and was discharged to an extended acute care facility dependent on ventilator support. Before discharge, a repeat echocardiography revealed normal cardiac function with a left ventricular ejection fraction >55% but did not show evidence of myocardial calcification. 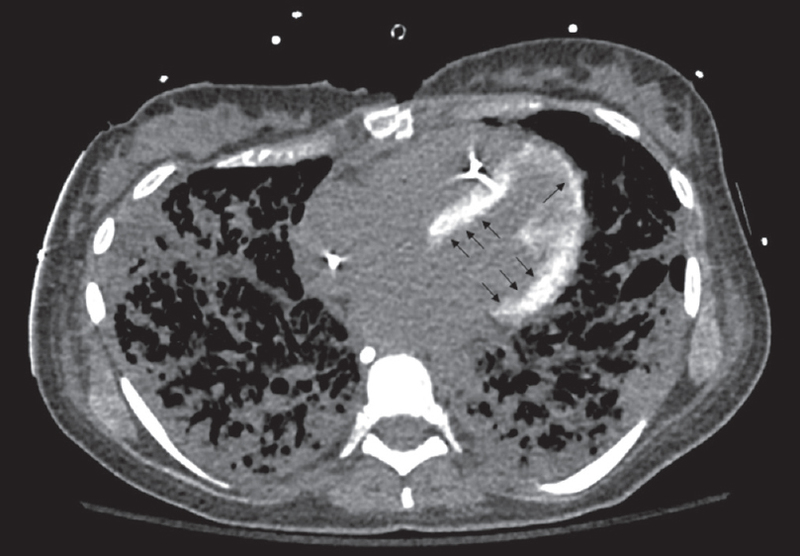 A CT of the chest [Figure 2], however, showed left ventricular myocardium with a density of 300 Hounsfield units, suggestive of dystrophic calcification. Calcification of the coronary arteries or cardiac valves is a common finding in patients. Cases of myocardial calcification following tissue infarction have been previously reported. Nonischemic myocardial calcification from severe sepsis, however, is a rare clinical event and is associated with significant morbidity and mortality. This case streptococcal TSS with sepsis-induced cardiomyopathy is a rare example of the morbidity associated with myocardial calcification. Owing to its rarity, the pathophysiology underlining acute calcification of the myocardium in septic shock largely remains unexplained. The most plausible hypothesis is that flow disturbances as well as a storm of endotoxins, cytokines, and catecholamines create damage to myocardial tissue. These sites of injury become necrotic lesions that serve as foci for dystrophic calcification., CT is the gold standard test for detection of myocardial calcification. Echocardiography is a less sensitive imaging modality for detection of myocardial calcification and can even appear normal in confirmed cases. This case serves as a reminder to clinicians that dystrophic calcification can occur in the myocardium in severe sepsis-induced cardiomyopathy. Irreversible myocardial injury and dystrophic calcification can significantly affect cardiac function. Diffuse myocardial calcification, specifically, can disrupt the cardiac conduction system and lead to cardiac arrhythmias as well as cardiac arrest. Thus, it is important that clinicians evaluate their patients for cardiac calcification following hospitalization for sepsis. An echocardiogram, although not the most sensitive test for detecting myocardial calcification, should be performed to assess cardiac function. Gore I, Arons W. Calcification of the myocardium; a pathologic study of 13 cases. Arch Pathol (Chic) 1949;48:1-12. Ananthakrishna R, Nagaraja M. Dystrophic myocardial calcification. Indian Heart J 2016;68:S180-1. Grayzel DM, Lederer M. Metastatic calcification. Arch Int Med 1939;64:136-47. Torfs M, Salgado R, Van Herck P, Corthouts B, Robert D, Parizel PM, et al. A curious case of acute myocardial calcifications. Circulation 2016;133:e426-7. Katoh H, Ogihara T, Iyori S. Postpartum toxic shock syndrome: A report of a case. Jpn J Med 1988;27:71-3. Flierl MA, Rittirsch D, Huber-Lang MS, Sarma JV, Ward PA. Molecular events in the cardiomyopathy of sepsis. Mol Med 2008;14:327-36. Grocott-Mason RM, Shah AM. Cardiac dysfunction in sepsis: New theories and clinical implications. Intensive Care Med 1998;24:286-95. Fisher CJ Jr., Horowitz Z, Albertson TE. Cardiorespiratory failure in toxic shock syndrome: Effect of dobutamine. Crit Care Med 1985;13:160-5. Takasu O, Gaut JP, Watanabe E, To K, Fagley RE, Sato B, et al. Mechanisms of cardiac and renal dysfunction in patients dying of sepsis. Am J Respir Crit Care Med 2013;187:509-17.
van Kruijsdijk RC, van der Heijden JJ, Uijlings R, Otterspoor LC. Sepsis-related myocardial calcification. Circ Heart Fail 2011;4:e16-8. Turkay A, Mirac O, Cafer A, Nuri C, Akbas T, Ozen M, et al. Cardiac calcification following severe sepsis: A case report and review. J Anesth Clin Res 2014;5:409. Akbas T, Özen M, Adigüzel C, Cimsit N, Karakurt S. Cardiac calcification following severe sepsis: A case report and review of the literature. J Anesth Clin Res 2014;5:5.